FINALLY! 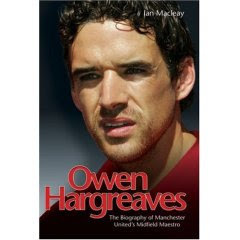 Owen Hargreaves unauthorized (I believe) bio is out in print and available for purchase. After months of being told by Amazon that it wasn't ready, it mysteriously showed up in my mail. I haven't read a page yet but I can tell you that the author was stingy with the photos and the type is rather large...hmmm, not very promising yet - still, I'm just excited that it exists! There's always time to diss it later! You know what? I think I'll read it. I've read Ronaldo's (a big disappointment - it was so superficial and had hardly any substantive matter but I don't know why I'm complaining because I doubt I could handle more than 10 pages of substantive matter of Ronaldo anyway). I only read it for the pictures. Back to the point, I'll give Owen a try just to hear about his life and all. I'm sick of hearing about troubled childhoods though I do have sympathy for those people. Props to CR and people like Gilberto and a lot of the other Brazilians for overcoming such feats but I don't want to hear another story about how someone was dirt poor and then had to work two jobs AND had to go to their soccer academy to get better and eventually dropped out of school at a high risk to achieve their dreams. I'm not insensitive or anything, I'm just tired of it.